Tech-savvy consumers, hold on to your tablets and phones, we’re about to get wild! As the most of you this year’s Mobile World Congress 2014 was held at the end of February in Barcelona and it was spectacular. The new gadgets unveiled at the Mobile World Congress 2014 have left us speechless and we just can’t wait to get a hold of them and test them all and tell you all about it. 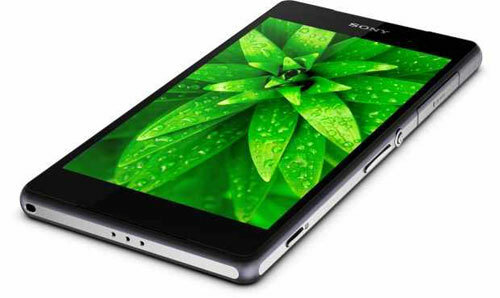 Today, we’re going to present the star of the congress: the Sony Xperia Z2. Sony Xperia Z2 is a stunning Android phone with so many great things about it, that we simply can’t find anything wrong with it. If you love Android phones, we guarantee you will adore this one. Before we get started, take a look at some popular free Android apps for you to get inspired and even maybe make a wish-list in case you’re planning on getting the Sony Xperia Z2. We want it and we want it now! The Mobile World Congress 2014 was all about Android phones. Even Nokia, who is a legendary Windows phone producer, put out three Android phones: the Nokia X, Nokia X+ and Nokia XL – all affordable and pretty smart. The Sony Xperia Z2 is a perfect Android phone that you will enjoy for many years to come. If you’re into Android phones, we think this one is the best on the market. If you had to choose one thing that the Sony Xperia Z2 has over Samsung Galaxy S5 it’s the design build. The S5 is made from plastic, and the Xperia Z2 is made from one-piece of aluminum frame with glass panel. It has a beautiful 5.2’’ display with a great screen to phone size ratio. Basically, when you’re looking at your screen, you only see the display, not the phone. The phone is simply beautiful, to be honest! This phone has a quad-core Snapdragon 801 processor. It’s fast, can run multiple apps smoothly at the same time and will give your battery a break. This thing’s stronger than what people had to go to the Moon with! And the graphics are made up of an updated Adreno 330 GPU that will help you sail through 3D games. Smartband is an accessory for your Sony Xperia X2 that you can wear as a bracelet and it will track your day. Whatever you do, it will get recorded: your movements, your entertainment and your communication. Then you can check your day out on your Xperia Z2 smartphone. The Mobile World Congress 2014 was chalk full of smartwatches that pair with phones, but the Smartband is a simple tool that does simple, yet amazing tasks. Oh, the battery on the Sony Xperia Z2 is really gorgeous! You can talk up to 19 hours, listen to music up to 120 hours, play video up to 10 hours and its standby time is an incredible 740 hours. The innovation about this particular model is the Stamina Mode. As you well know, smartphones will hog a lot of energy, with all those apps and the notification center. But Stamina mode will minimize battery drain because it recognizes the times when you’re not using your phone and automatically shuts down the functions you don’t need and keeps the ones you do need (like the important Facebook notification center). When you press the power button, everything is back on! Pretty clever, isn’t it? You’ve got digital noise cancellation that will block out the world; up to 98% ambient sounds will be cancelled. The sleek headphones that come with the smartphone sample the noise through a microphone and are able to select what goes through! And music has never sounded better on a smartphone – with Clear Audio+ technologies the distortion will be minimized and the music will he heard clear and balanced. The speakers on the Sony Xperia Z2 aren’t less than awesome! The Sony Xperia Z2’s camera is stunning and we’ve mention why below, but what good is a great camera if you don’t have the apps to have fun with? The smartphone comes with many apps already installed. Some of them are: Timeshift video (which captured high speed clips at 120 fps and you can slow down bits of your clip or all of it), Background Defocus (to blur your background or foreground), AR Effect (to add funny animations to your photos and videos), Info-eye (it will tell you all the relevant information you want through your camera viewfinder; point your camera at a famous building or a wine and it will give you information about them) and Sweep Panorama (creates wide-angle panoramic photos). The Sony Xperia Z2 has a 4k camcorder! 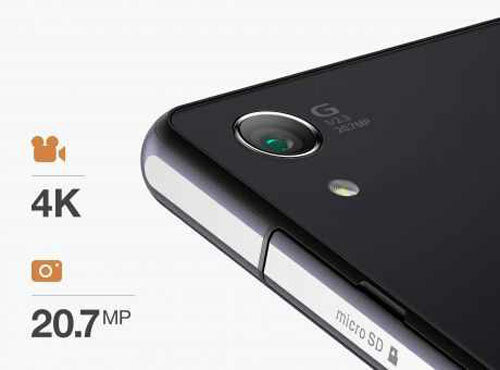 This means that the stunning 20.7MP camera will let you capture in ultra-high resolution. Just for you to have an idea what this means, know that Full HD means 1080p, so what you’re getting with your phone will be Ultra High Definition. Actually, the display of the smartphone isn’t Ultra HD, so in order to view the footage at its true resolution you’ll be needing an Ultra HD laptop screen or television. The camera on the Sony Xperia Z2 is something that people are still talking about and will keep talking about for months. It has a whopping 20.7MP and it is large (1/2.3’’) – the Exmor RS sensor designed especially for mobiles has an incredibly high sensitivity which reduces noise and reproduces details with great fidelity. The G lens on the Xperia Z2 is a 27mm wide angle lens that allows light to enter in dark conditions, so your pictures will look great even when taken in low light. The intelligent BIONZ for mobile image-processing engine is really what makes the Sony Xperia Z2 take the wonderful picture that it does – it employs algorithms for stunning realism in every shot you take. It’s a powerful computer in itself that analyzes every picture you take and improves it. It also allows you to take photos in motion; they’ll come out crisp and sharp, thanks to the BIONZ’s Motion Detection. The waterproof feature was a great hit at the Mobile World Congress 2014 and many of the devices were waterproof and dust resistant. 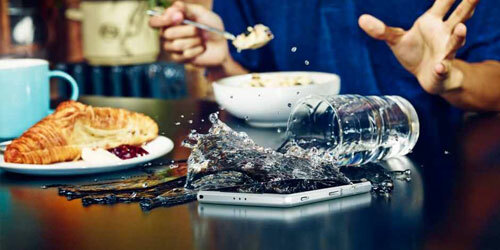 But what does Sony Xperia Z2 have and other phones don’t when it comes to waterproofing? Well, you can take it underwater with you, which is something that Samsung doesn’t recommend with its Galaxy S5. You can swim in freshwater with it for up to 30 minutes and even dive up to 1.5m with it and this makes Sony Xperia Z2 one of the funkiest gadgets out there and one that will surely be snatched by many once it becomes available. In short, we believe that the Sony Xperia Z2 is the best phone out there, at this moment! Do you like the Sony Xperia Z2? Would you prefer another smartphone unveiled at the Mobile World Congress 2014? Tell us your thoughts in the comment section below, we’d love to hear from you!